This airplane cake was for our friends son's 1st birthday. The birthday theme was airplane adventures. My airplane adventure cake is a two layer chocolate cake with a chocolate gnache filling, topped with homemade buttercream icing then covered with blue Wilton fondant. I had to blow up the invitation to increase the size to make tracing more suitable for myself. I then traced and cut the airplanes out to be used as a pattern. 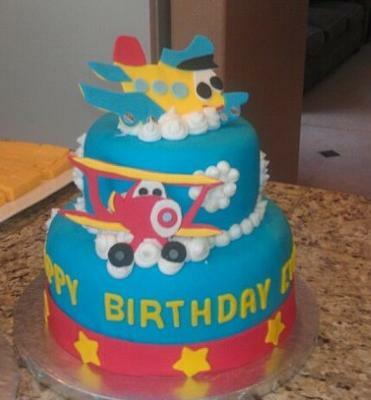 For the airplanes I mixed fondant and gumpaste and colored it with red red, lemon yellow, royal blue and sky blue. Laying the patterns on top of the fondant/gumpaste mix, I cut around my pattern to get my base image to work with. I traced and cut out the smaller details of the airplane to glue on top of my airplane. Vanilla extract was used my "glue". For the cake I used devils food cake mix, and the filling is a whipped chocolate gnache. I covered the cakes with my homemade buttercream and then covered with blue fondant. The trim and stars are made of fondant. I used buttercream for the clouds and used it as the glue to hold the airplanes on the cake. My cake is being supported and held in place by 3 dowels. Total prep time for this cake was approximately 10 hours. Cake decorating itself was approximately 2 hours. The outcome was fantastic. The parents were absolutely in love with the cake and so were the guests. I couldn't have been happier. In the end I was offered another job making a cake for a baby shower. What size pans did you use and how many layers? The whole composition of the cake was very well executed and the colors complimented each other beautifully. It immediately reminded me of the cartoon program and I can see how any child will be totally delighted. Well done! This is a really great cake Jennifer and you must have enjoyed making it. Very well done. You made lots of folk happy with this cake. What an awesome cake! I love it! It is so colorful and neat! I love this cake, very well done, keep up the great work. you go girl great job. Very impressive, love the colors and character the whole cake is AWESOME! This is the cutest cake ever! The bakers description of it made it sound mouth watering. And how skillful to enhance the invitation for stencils! Well done lady!! !